(l-r) Doris Bridges, Steve Harvey and Marjorie Harvey. It's a true family affair on Celebrity Family Feud when, for the first time, host Steve Harvey's family is in position to battle...themselves. In an all-new episode of the ABC prime-time game show, the Harvey men battle it out against the Harvey women, and Steve is more than a little amused at the match-up. The star may find herself in the doghouse with her husband after her hilarious answer to one question. However, things get a little uncomfortable for the Harvey family when Steve's wife Marjorie, who is heading up the team with their sons, offers up an answer during the game Steve doesn't find funny—at all. Check out the exclusive clip below to find out why the Harveys won't be getting a pool anytime soon. In addition to the the Harvey match-up, the episode features six-time NBA champion Kareem Abdul-Jabbar and his family as they take on retired NBA Legend Ralph Sampson and his brood. 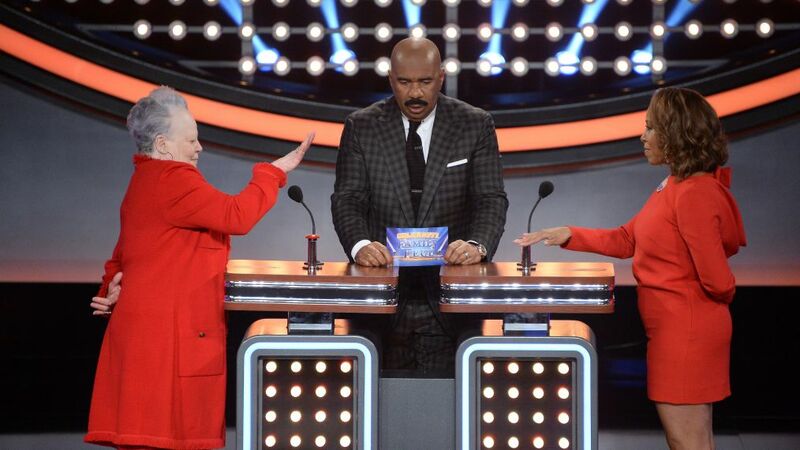 Celebrity Family Feud, Sundays, 8/9c, ABC.